One thing we all have in common about opinions: everyone has one! This is the place to write your opinion on any subject of interest to conservative readers. Your opinions will not be edited nor must you get approval. But the rules of the game prevail: no name calling or bomb throwing at fellow conservatives. The enemy is not conservatives with whom you disagree so focus on candidates, elected officials, progressives, general topics that affect all of us in Arizona and America. With the 2016 election cycle on the horizon, the shenanigans going on behind the scenes at the local, state and federal levels, there is no end of opinions that are valid and sometimes, game changing. Every opinion has the potential to be the one that throws an unexpected light on an issue. This is the place to post your opinions on a variety of topics, whatever is important to you. It's unlikely that most of us can get a letter to the editor published in the AZ Republic. But you can here. AFA will feature some of them and blast out links to some of them. So open up and let us hear what's on your mind. Follow the simple rules posted above. It's very easy to do: first, click +Join to get posting privileges and then scroll to the bottom of the Discussions section. Click on Add a Discussion and add a title and then write in the big box what is bothering you. Or what satisfies you. Or what puzzles you. This page will stay up so long as you are interested in using it and others are interested in reading it! Daily Mail: "Required Reading?" More Like "Required: Rehab"
You need to be a member of Editorial Opinion to add comments! PEOPLE IF YOU MISSED THIS PROGRAM ON FULL MEASURE AND WANT TO KNOW WHO, WHY, HOW.... GOVERNMENT TRULY WORKS.LISTEN TO SENATOR KEN BUCK. I admit, I'm a recovering Republican. Upon convincing myself America's ills are the result of Acts exceeding the clear bounds of its jurisdiction under the Constitution I gave up my role as a PC, accepted that both major parties are guilty of the unlawful Acts and pending a change to existing monetary policy upon which elected officials cling to like leeches is replaced with a Constitutionally compliant policy nothing will change. Regarding Communism in the US: Americans are governed by the ten planks of the Manifesto. See http://www.criminalgovernment.com/docs/planks.html. Please send your completed questionnaire to my email at _________________________ or my home at _______________________________. Should you have questions please call me at ­­­­­­­­­­­________________. As lay person, there are many questions about this memorandum that do not seem to be being addressed by either the press or by the politicians. We need to know, clearly, when and where this supposed conversation took place. We also need to know the identity of any and all persons present at the time of the conversation. If only Trump and Comey were present at the time then it is purely a matter of recollection of the two parties. Was Comey making notes at the time of the conversation or were the reconstructed from memory at a later time? If so, when were they reconstructed? Did they set forth exact "words" used or were the words paraphrased? If the words were paraphrased, then they probably do not convey the conversation accurately. This would appear to be much-a-do about nothing. Lets kick-out the Traitors in We the People Government for "Dereliction of Duty". Instead of doing their duty(SERVING AND PROTECTING) and running the People GOOD Government . What The Hell Is Wrong With OUR Representatives Chasing Ghosts Stories(Russian Party Hackers) there is no credibility of Law to pursue. What are the Legal Charges to stem this Warlock Hunt ? Therefore, WE the People PARTY, AFA and Tea Party must STAND-UP AND START-UP Petition DRIVES IN EVERY STATE OF THE UNION to Remove The Traitors from the People GOOD Government. END THIS CIRCUS OF CLOWNS IN OFFICE. Why doesn't anyone ever address the issue of corruption in Mexico? How do people from various countries get to the northern border of Mexico? Why doesn't Mexico have troops along their northern border? Why doesn't Mexico eliminate the cartels responsible for shipping drugs into the United States? The Mexican government knows who they are and where they are located. Why don't the Mexican people speak out about the corruption and poverty that caused them to leave Mexico for the United States? They come here and seek to change our laws but never say a word about why they left Mexico. When was the last time you heard a politician or anyone for that matter say, "Get your house in order Mexico!" Isn't it amazing that all the discussion about illegal immigration never touches these issues? You My Friend have hit the Target and Bull-Eye. HAVE YOU NOTICE THAT THEY STAY IN THERE NEIGHBORHOODS FOR THE MOST PART=== FOR THERE OWN SAFETY CAUSE THEY KNOW THAT MOST OF THE PEOPLE THERE ARE COWARDS LIKE THEY ARE ====AN THEY CAN GET AWAY WITH IT.----- LIKE ANYTHING ELSE YOU DO WRONG ----==IF YOU DO IT ENOUGH TIMES YOU WILL MAKE THE MISTAKE OF DOING IT WHERE SOMEONE THAT'S THERE ARE'NT AFRAID TO STOP YOU ;;;AND THAT'S WHERE YOU CAN CALL IT OVER REACTION OR WHAT EVER YOU WANT TO CALL IT==== BUT SOME PEOPLE ARE GOING TO GET KILLED .AND THEY WILL DESERVE IT BECAUSE OF THEIR STUPIDITY ====AND IT CAN BE TOTALLY BLAMED ON OUR SCHOOL SYSTEM OF MISINFORMING AND OUT RIGHT LYING ABOUT IT..==== ON WHO DONE WHAT AND WHEN THEY DID IT ====BY OUR GOVERNMENT AND CONGRESSMEN AND SENATOR ..===MOST OF THE BLACK FOLKS IN THIS COUNTRY THINK THAT THE DEMOCRATIC S ARE THE ONES WHO FREED THEM FROM SLAVERY....AND PASSED ALL THE CIVIL RIGHTS LAWS THE LAWS THAT THEY HAVE TODAY .===THE REPUBLICATIONS ARE THE ONES THEY SHOULD BE THANKING ===CAUSE THEY WERE THE ONES THAT FREED THEM FROM SLAVERY AND PASSED 90 PERCENT OF ALL THE CIVIL RIGHTS LAWS OF TODAY ====== AND I MIGHT ADD IN SOME CASES NOT ONE SINGLE DEMOCRAT VOTED FOR OVER HALF OF THEM EXCEPT THE ONES WHO VOTED AGAINST THEM ====THIS COUNTRY AS WHOLE HAS SHOWED EXTREME RESTRAIN ABOUT WHAT HAS HAPPEN TO OUR COUNTRY IN THE LAST 8 YEARS.====THE MEDIA UP UNTIL THE INTERNET HAS BEEN THE ONLY INFORMATION THAT THE PEOPLE HAVE RELIED UP ON.... THEY NOW KNOW MOST OF THE TRUTH AN NOW THEY AT LEST SOME HAVE FOUND OUT THAT THE HAVE BEEN LIED TO. IN SOME CASES TELLING FOLKS DOWN RIGHT CRIMINAL LIES .=========== THE FOLKS THAT ARE ACTING LIKE IDIOTS TODAY AN MOST OF PEOPLE THAT AGREE WITH THEM DO NOT KNOW WHAT A FRAGILE THING OUR LIBERTY IS .===== MAINLY BECAUSE THEY WERE NEVER TAUGHT ABOUT OUR PAST HISTORY. ====AND I AM AFRAID BECAUSE OF THE LIES THAT HAVE BEEN TOLD... AND THERE ARE SO MANY PEOPLE THAT DON'T KNOW OUR HISTORY WE ARE NOW DOOMED TO REPEAT IT.===== I'M JUST SAYING. Will Obama Delay Or Suspend Election If Hillary Is Forced Out? Even though there are less than ten days to go until election day, this scandal has the potential to possibly force Clinton out of the race - if that happens, could Barack Obama delay or suspend the election until a replacement candidate can be found? Since the days of the Indus Valley, Babylonians and Mesopotamia over 5,000 years ago, people have struggled to be free from control of the ruling classes. But those who rule have most always had the weapons and resources to keep the masses from exercising their God-given rights to live free. The Sumerian priests (5th to the 3rd millennia BC) forced the people to bring their grain crops to the church. The priests then distributed the grain to whomever they decide to, on whatever their whim was at the time. Most often the farmers of the grain were not the first to receive the grain they grew. Stalin starved as many as 7,500,000 Ukrainians by taking away their food by force of arms, in what became known as the Ukraine terror famine of 1930 to 1933. He isn't the first leader to kill millions of his own people. Mao's Great Leap Forward killed 45 million people in four years. Mao Zedong, founder of the People's Republic of China, qualifies as the greatest mass murderer in world history, said an expert who had unprecedented access to official Communist Party archives. Hitler's toll of dead is much more than the 6 million Jews he killed in the death camps of Auschwitz-Birkenau, Belzec, Chelmno, Majdanek, Sobibor, and Treblinka. This pressure by the masses to be free and the rise of world conquerors, has led to the most brutal and vicious wars in all of human history, until the Twentieth Century when brutality and savagery reached its peak with always growing weapons of mass destruction. 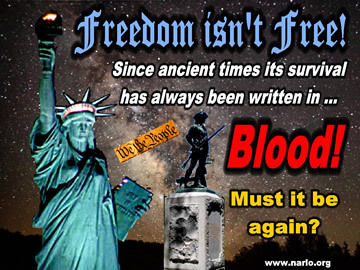 The truth is, the birth and ultimate survival of freedom has always been written in blood. I must admit, I'm in this camp. Sadly!